The Mitochondrial Eve is NOT our common ancestor, or even common genetic ancestor. She is the most-recent common ancestor of all humans alive on Earth today with respect to matrilineal descent. That may seem like a mouthful, but without even a single one of those qualifying phrases, any description or discussion of the ME reduces to a lot of nonsense. Evolution of the bicameral brain facilitated the development of human beings. With this singular development, life was raised to a level beyond mere instinctual existence. The neocortex enabled our species to search consciously for cause and effect, to apply logic to existence, and to develop an understanding of the world beyond its own, immediate survival needs. - John H. Brand, J.D. 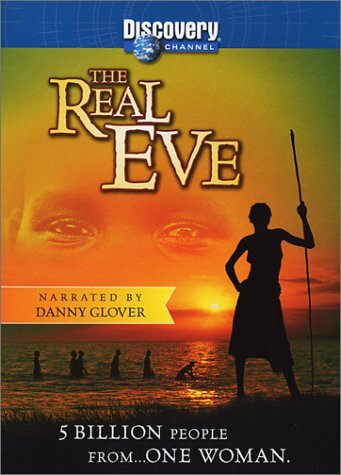 Interview : AllAfrica's Charles Cobb Jr. spoke with the film's producer, Paul Ashton about 'The Real Eve' prior to its airing on Discovery channel. The greatest journey ever undertaken left behind a trail of unanswered questions: How did our species arise and spread around the globe to become the most dominant creature on the planet? Part of the answer came two decades ago, when scientists stunned the world with the finding, based on genetic research, that all humans alive today can claim as a common ancestor a woman who lived in Africa some 150,000 years ago ? dubbed, inevitably, "Eve." But while the notion of an African origin of the human family has grown to be accepted by most scientists, the details of how Eve's ancestors swept out of Africa to populate the rest of the world have remained murky. Now a team of scientists claim that, based on research on the ancient climate, findings in archaeology and a new, clearer genetic picture of how the human family tree has branched over the eons, the ancient itinerary of the human diaspora can finally be pieced together. It is an epic story of escape from starvation, glaciers and volcanoes and braving shark-infested waters in flimsy rafts. And like any good tale, it has a surprise ending: Contrary to established thinking, it appears that our human ancestors took a more southerly route out of Africa, traveling east across the Red Sea into what is now Yemen, and then through India and all the way to the far reaches of Australia, before they swung up into Europe. "There was only one migration out of Africa," says Stephen Oppenheimer of Oxford University, who is a leading proponent of this new synthesis of our species's incredible journey. "They couldn't go north ? that was blocked by a desert ? so they had to go south." A crucial cornerstone of Oppenheimer's piecing together of the human itinerary is the recent finding by Huddersfield University geneticist Martin Richards and his colleagues that the world's entire population can be traced back to a family tree that has its roots in Africa and a single branch leading out of the continent and into the rest of the world. Based on analysis of thousands of DNA samples from people worldwide, Richards' research reveals a detailed map of the human family tree and its various branches. Richards' research extended the work of scientists over the past two decades who have been reconstructing human origins by studying snippets of DNA from tiny cellular structures called mitochondria. Part of every cell in the human body, mitochondria produce the energy needed by all living creatures and, remarkably, possess their own DNA that is completely independent of the principal cellular DNA residing in the nucleus. Known as mitochondrial DNA ? or mtDNA ? this genetic material has a property that makes it a unique tool for studying human origins: During conception, half the mother's DNA and half the father's DNA merge to create a unique suite of genes that goes into creating a human being. But mtDNA does not undergo this genetic reshuffling; rather, the mitochondria ? along with their mtDNA ? in a sperm cell wither and die, while the mitochondria present in the egg cell live on intact from generation to generation. Thus everyone carries with them a more-or-less exact copy of the mtDNA from their mother, and their mother's mother, and her mother, and her mother, and so on back through countless generations. The term "more or less exact" is the key to scientists solving the mystery of human origins. That's because like all DNA, mtDNA is subject to random mutations over the eons. And because these mutations are passed intact to the next generations, they in effect become "tracers" of family branches. If two strands of mtDNA from two different people reveal the same mutation, these people must share the same ancient great-great-great-grandmother from whence this mutation arose. Working from the assumption that genetic mutations occur more or less regularly over time, scientists can compare two samples of mtDNA, noting where they have shared mutations and where they do not share mutations, and resolve the time in prehistory when the peoples' ancestral populations diverged. Using this technique, researcher Rebecca Cann and her colleagues showed that all humans can be traced back to an ancient mitochondrial "Eve" who lived in Africa perhaps 150,000 years ago. This "Eve" was by no means the source of all the genes in the world's living population. After all, each person is a reshuffled combination of 30,000 genes from many different ancestors stretching back generations. But each person's mtDNA is a copy from only one direct line of ancestors: their mother's mother's mother's mother, etc. In the same way, the mtDNA from Eve merely acts as a tracer that links all present-day humans to a single population of ancient humans, estimated at 10,000 people or so, who lived in Africa several hundred thousand years ago. While Richards' genetic research suggests that only one branch of ancient humans migrated out of Africa to give rise to modern populations, research on ancient climate changes helps pinpoint the time when this migration must have occurred, argues Oppenheimer. Some 80,000 years ago, the world's climate began to cool into a period of glaciation. The polar ice caps reached far down into Europe, lowering sea levels and turning much of Africa into arid desert. This climatic shift occurred roughly at the time when the genetic evidence suggests that the tree of human life sprouted a branch that crossed onto the Arabian Peninsula toward India and Southeast Asia. Indeed, notes Oppenheimer, human-made tools dating back nearly 75,000 years have been found as far east as Malaysia. From there, our human ancestors pushed across shark-infested waters to Australia, where they left behind stone artifacts dating back 60,000 years. There were no doubt other human migrations out of Africa before this time. For example, ancient human remains dating from 100,000 to 120,000 years ago have been unearthed in what is now Israel. However, these populations, like others, perished without leaving their genetic imprint on present-day humans. By the time the climatic changes gave rise to the exodus some 80,000 years ago, the migration pathway out of Africa through the Near East was blocked by the Sahara desert, says Oppenheimer, and so the only way out was southward. It was only after the climate shifted again some 50,000 years ago, creating strong monsoons that turned what was once desert into the lush growth of the so-called "Fertile Crescent" stretching from the Arabian Gulf to Turkey, that humans had the pathway to begin the push into what is now modern-day Europe. The land at that time was populated by another kind of human ? Neanderthals ? who had reached there hundreds of thousands of years before. While the two species of humans shared the continent for more than 10,000 years, recent studies of DNA drawn from Neanderthal fossils reveal that there was no interbreeding between the two populations that left a trace in the modern world. Indeed, nearly all Europeans and by extension, many Americans can trace their ancestors to only four mtDNA lines, which appeared between 10,000 and 50,000 years ago and originated from South Asia. The final stage in the human odyssey was again triggered by climate change: The genetic evidence suggests that as the seas retreated during the buildup of the polar ice caps 20,000 to 25,000 years ago, humans crossed over the bridge of land ? now underwater ? that connects what is now Siberia and Alaska, says Cambridge University's Peter Forster. The distinctive makers in the strands of mtDNA they brought with them are still found in Siberia and Asia today. These ancient humans spread throughout all of the Americas, surviving the intense glaciation that followed, and leaving stone tools dating back 16,000 years at a site in present-day Pennsylvania. The peopling of the planet was complete. Despite the sweeping saga of migration and branching of the human family tree over the past 7,000 generations since "Eve," perhaps the most startling result of the new picture of human evolution is how very closely related are all humans. In fact, the research reveals that there is less genetic variation among Earth's entire population of humans than there is in a typical troop of our closest relative, the chimpanzee. In the quest to find ancient family ties, one need look only to one's neighbor ? or to the far end of the globe. "We are all born with an extraordinary interest in where we came from, and who our relatives are," says Oppenheimer. "This really brings home that we are just one big, very close family." Note: In accordance with Title 17 U.S.C. section 107, this material is distributed without profit or payment to those who have expressed a prior interest in receiving this information for non-profit research and educational purposes only. For more information go to: www.law.cornell.edu/uscode/17/107.shtml. If you wish to use copyrighted material from this site for purposes of your own that go beyond 'fair use', you must obtain permission from the copyright owner.